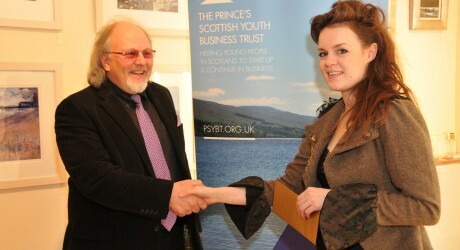 AN Edinburgh based fashion designer has been revealed as the winner of the 2010 Jolomo Arts & Crafts PSYBT Award. Bespoke womenswear designer, Judith R Clark (26), was presented with a £3,000 cash prize by renowned Scottish contemporary artist, John Lowrie Morrison [Jolomo] at the awards, which are organised by The Prince’s Scottish Youth Business Trust (PSYBT). The runners-up were Lauren Crawford (25) who lives in Fife and designs handwoven textiles, and Dundee based silversmith Genna Delaney (29). This year, the awards and the prize money were extended to include eligible arts and crafts businesses throughout Scotland. Judy Clark completed her internship with fashion designer, Alexander McQueen, in London in 2006 and she now runs her own successful fashion studio in Haymarket in Edinburgh, thanks to funding and advice from PSYBT. Her bespoke designs, which have been showcased in the UK, New York and Tokyo, are made using Scottish wools and Harris Tweed, which is sent from the Hebrides by her great-uncle Donald who produces hand woven cloth on his loom in Shawbost. As well as being inspired by her Scottish heritage, Judy’s travels also influence her designs and choice of fabrics, which include exclusive Nepali hand carved buttons, hand-dyed silks, vintage lace and other trinkets collected from foreign shores. Last year, she was nominated designer of the year at the Scottish Style Awards 2009. The young designer specialises in unique fabrics and fashion accessories for all occasions including scarves, collars, wedding shawls, and garters in luxury silks and woollen fibres. All her accessories are made by hand using a combination of traditional and innovative weaving structures and techniques to complete each signature item. Ms Crawford has established a studio in Fife and is designer in residence at Duncan of Jordanstone College. Jewellery designer and silversmith, Genna Delaney, established her business with help from PSYBT in April 2007. Based in the Wasps artist studios in Dundee, Ms Delaney produces handcrafted award winning designs and one off pieces. Architecture is a major influence in her work which features geometric designs and the Scottish landscape inspires some of the curves and shapes of her pendants. In the future, she hopes to run her own retail outlets and a workshop where she can teach jewellery making techniques. MEDIA RELEASE issued by Panache Communications. You too can post media releases (aka press releases) on allmediascotland.com. For more information, email here.